Notes for polynomials chapter of class 10 Mathematics. Dronstudy provides free comprehensive chapterwise class 10 Mathematics notes with proper images & diagram. (1) Polynomial : The expression which contains one or more terms with non-zero coefficient is called a polynomial. A polynomial can have any number of terms. For Example: 10, a + b, 7x + y + 5, w + x + y + z, etc. 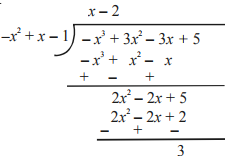 are some polynomials. (2) Degree of polynomial : The highest power of the variable in a polynomial is called as the degree of the polynomial. For Example: The degree of p(x) = x5 – x3 + 7 is 5. (3) Linear polynomial : A polynomial of degree one is called a linear polynomial. For Example: 1/(2x – 7), √s + 5, etc. are some linear polynomial. (4) Quadratic polynomial : A polynomial having highest degree of two is called a quadratic polynomial. The term ‘quadratic’ is derived from word ‘quadrate’ which means square. In general, a quadratic polynomial can be expressed in the form ax2 + bx + c, where a≠0 and a, b, c are constants. For Example: x2 – 9, a2 + a + 7, etc. 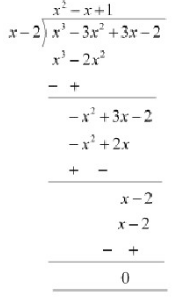 are some quadratic polynomials. (5) Cubic Polynomial : A polynomial having highest degree of three is called a cubic polynomial. In general, a quadratic polynomial can be expressed in the form ax3 + bx2 + cx + d, where a≠0 and a, b, c, d are constants. For Example: x3 – 9x +2, a3 + a2 + √a + 7, etc. are some cubic polynomial. For Example: Consider p(x) = x + 2. Find zeroes of this polynomial. p(-2) = -2 + 2 = 0. Thus, -2 is a zero of the polynomial p(x). In general, for a linear polynomial ax + b, a ≠ 0, the graph of y = ax + b is a straight line which intersects the x-axis at exactly one point, namely, (-b/a , 0) . Therefore, the linear polynomial ax + b, a ≠ 0, has exactly one zero, namely, the x-coordinate of the point where the graph of y = ax + b intersects the x-axis. For Example: The graph of y = 2x - 3 is a straight line passing through points (0, -3) and (3/2, 0). 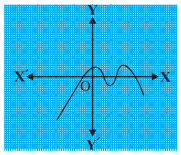 Here, the graph of y = 2x - 3 is a straight line which intersects the x-axis at exactly one point, namely, (3/2 , 0). Case 1: The Graph cuts x-axis at two distinct points. The x-coordinates of the quadratic polynomial ax2 + bx + c have two zeros in this case. Case 2: The Graph cuts x-axis at exactly one point. The x-coordinates of the quadratic polynomial ax2 + bx + c have only one zero in this case. 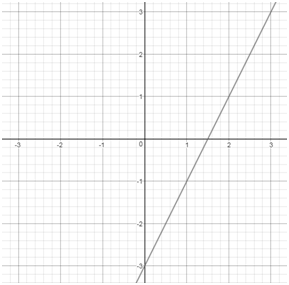 Case 3: The Graph is completely above x-axis or below x-axis. The quadratic polynomial ax2 + bx + c have no zero in this case. For Example: For the given graph, find the number of zeroes of p(x). From the figure, we can see that the graph intersects the x-axis at four points. Therefore, the number of zeroes is 4. In general, if α and β are the zeroes of the quadratic polynomial p(x) = ax2 + bx + c, a ≠ 0, then we know that (x – α) and (x – β) are the factors of p(x). Moreover, α + β = -b/a and α β = c/a. In general, sum of zeros = -(Coefficient of x)/(Coefficient of x2). Product of zeros = (Constant term)/ (Coefficient of x2). For Example: Find the zeroes of the quadratic polynomial x2 + 7x + 10, and verify the relationship between the zeroes and the coefficients. Thus, value of x2 + 7x + 10 is zero for (x+2) = 0 or (x +5)= 0. Or in other words, for x = -2 or x = -5. Hence, zeros of x2 + 7x + 10 are -2 and -5. Now, sum of zeros = -2 + (-5) = -7 = -7/1 = -(Coefficient of x)/(Coefficient of x2). Similarly, product of zeros = (-2) x (-5) = 10 = 10/1 = (Constant term)/ (Coefficient of x2). For Example: Find the zeroes of the quadratic polynomial t2 -15, and verify the relationship between the zeroes and the coefficients. Thus, value of t2 -15 is zero for (t +√15) = 0 or (t - √15) = 0. Or in other words, for t = √15 or t = -√15. Hence, zeros of t2 -15 are √15 and -√15. Now, sum of zeros = √15 + (-√15) = 0 = -0/1 = -(Coefficient of t)/(Coefficient of t2). Similarly, product of zeros = (√15) x (-√15) = -15 = -15/1 = (Constant term)/ (Coefficient of t2). For Example: Find a quadratic polynomial for the given numbers as the sum and product of its zeroes respectively 4, 1. Let the quadratic polynomial be ax2 + bx + c.
Given, α + β = 4 = 4/1 = -b/a. α β = 1 = 1/1 = c/a. Thus, a = 1, b = -4 and c = 1. Therefore, the quadratic polynomial is x2 - 4x + 1.
αβ + βγ + γα = c/a and α β γ = – d/a . (9) Division Algorithm for Polynomials : If p(x) and g(x) are any two polynomials with g(x) ≠ 0, then we can find polynomials q(x) and r(x) such that p(x) = g(x) × q(x) + r(x), where r(x) = 0 or degree of r(x) < degree of g(x). For Example: Divide 3x2 – x3 – 3x + 5 by x – 1 – x2, and verify the division algorithm. Here, quotient is (x – 2) and remainder is 3. Thus, division algorithm is verified. For Example: On dividing x3 – 3x2 + x + 2 by a polynomial g(x), the quotient and remainder were (x – 2) and (–2x + 4), respectively. Find g(x). Given, dividend = p(x) = (x3 – 3x2 + x + 2), quotient = (x -2), remainder = (-2x + 4). Let divisor be denoted by g(x). Hence, g(x) is the quotient when we divide (x3 – 3x2 + 3x - 2) by (x – 2). Therefore, g(x) = (x2 – x + 1). Thank u ...it was so much helpful ! 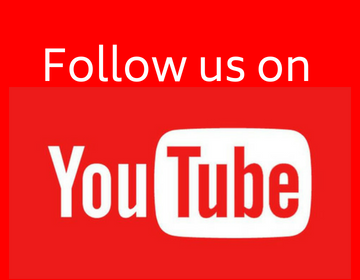 Thank you for providing best study material.